LITTLETON, Mass. 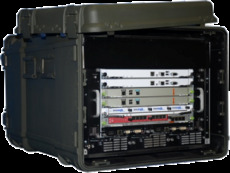 Engineers at SANBlaze Technology’s Defense Solutions Group have designed a new rugged AdvancedTCA (ATCA) solution called Rugged Compute Platform for Tactical Ops, or RCP-Tactical Ops. The new Commercial-Off-The-Shelf (COTS) is produced to meet the Size, Weight, and Power – Cost (SWaP-C) requirements and Modular Open Systems Approach of Department of Defense (DoD) acquisition programs. 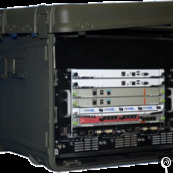 The RCP-Tactical Ops is targeted at mobile tactical operation centers, C4ISR applications, network-centric converged voice, video, and data solutions, mobile network operations centers, as well as shipboard, ground, and airborne battle management and communications systems. The new platform also supports SIPERNet and NIPERNet. The RCP was designed specifically to provide military users with the ability to process data collected through various reconnaissance methods in a rugged, lightweight, low power system, says Steve Looby, SANBLAZE director of product management. It can be used for frontline field or fixed mount deployments, he adds. The new SANBlaze system is modular with building blocks comprised of: storage, networked computing elements, and switch and payload blades that comply to the ATCA standard. Its payload blades are multi-core true 64-bit SMP, with as much as 192GB. The storage blades are 6TB per slot and RAID 01,5,6. The switch blades are multiport and 10Gb. The RCP-Tactical Ops works with a variety of rear I/O modules that can amte with SPARC and X86 processor blades. I/O options include: Fibre Channel, SVGA Video, ,USB, RS232C 9pin serial full Modem Control, networking and storage drive options. Each platform features has 10 Gigabit Ethernet (10Gbps) connections that can be used for pipelined packet processing in virtualized operating system environments. It also has AC (120/240V) and DC (-48/60V) power supply options cooling capabilities. RCP-Tactical Ops Solutions are available now. For more information, visit www.sanblaze.com.